Image © 2017 Estate of T. C. Cannon. In T.C. Cannon’s Two Guns Arikara, a stately Native American sits in an armchair, loosely holding cartoonish blue firearms. He’s dressed in a mash up of what looks like U.S. cavalry pants, Plains Indian and European garb, and sports ornate silver jewelry. His puffy violet hair cascades down against a riotous purple, polka-dotted background. Born in Oklahoma in 1948, Cannon was a member of the Kiowa Tribe. 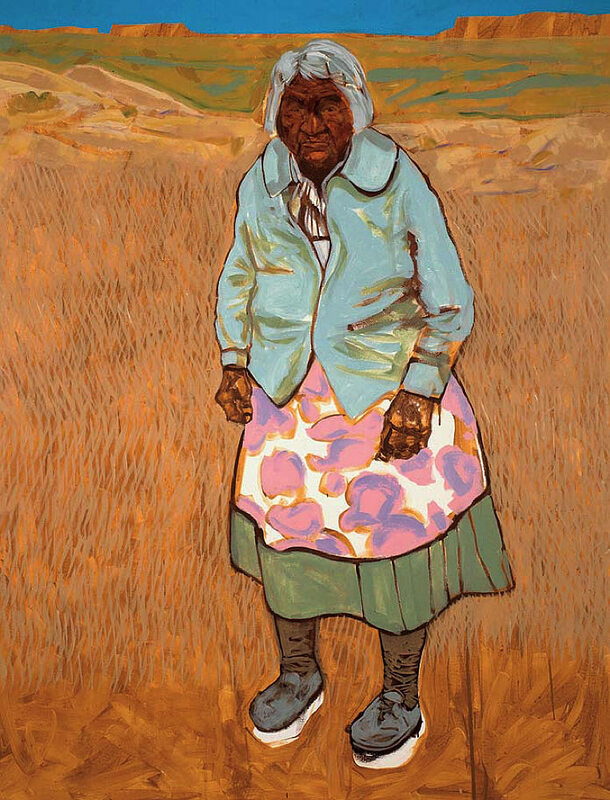 He went to art school, completing Mama and Papa Have the Going Home Shipwreck Blues (1966)—a simply rendered Navajo couple sitting unwittingly at the crossroads of American and Native American cultures—that influenced the New Indian Art movement, and then surprised those he knew by joining the U.S. Army, ultimately earning two Bronze Stars for his service during the Tet Offensive. Back home, Cannon was apparently conflicted about his role in violence and in suppressing other indigenous peoples. During the next decade, he produced a significant body of work that was at once deeply personal and political, developing his voice on canvas, and as a musician and writer. The art spoke to the inevitable co-existence of past and present, pain and triumph, and to the turbulence of the times. And it still does. He completed about 50 major canvases, along with more than a hundred sketches, drawings, poems, and personal documents, many also on display. In all, they illuminate a flourishing artistic vision, albeit one cut short. Cannon died following a car crash in Santa Fe, at the age of 31.